Tsurumi's submersible aerators are used at water treatment facilities to aerate and agitate industrial wastewater, livestock wastewater and other water that needs treating. More specifically, they provide the primary aeration in reactor tanks and aeration tanks at the heart of the water treatment process, and aeration and agitation in flow regulating tanks. 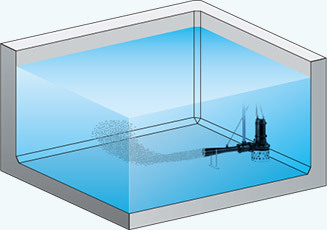 These aerators produce tiny bubbles in the wastewater by furiously mixing in air they draw from above the wastewater's surface, and discharge the aerated wastewater to the outside. The mixed flow of air and water contains a high amount of dissolved oxygen and makes aeration and agitation very efficient. Tsurumi offers two kinds of aerators in three series. 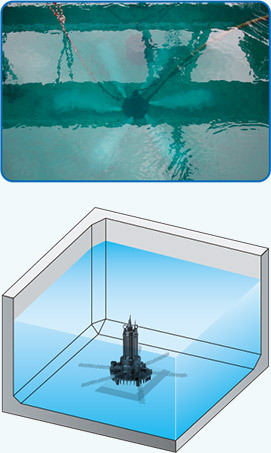 The TRN-series features Tsurumi's baseline submersible aerators that produce a high amount of dissolved oxygen and enable efficient aeration and agitation, while the BER-series and the PLS-series with aeration kit are submersible jet aerators that generate a powerful unidirectional flow. All three series are built to draw air themselves while submerged in wastewater, so they can aerate and agitate wastewater without requiring a blower, which greatly reduces both installation space and noise. Despite their simple structures, Tsurumi submersible aerators are packed with proprietary technologies that have been tested and proven over many years of R&D and market use, such as an anti-wicking cable, dual inside mechanical seals with silicon carbide faces and Oil Lifter. Moreover, they are designed and built for the degree of reliability and durability required for 24 hour-a-day continuous operation. Plus, when it is time for maintenance, it suffices to raise just the pump from the tank; the tank does not need to be drained as is the case of a plate/tube diffuser, so these aerators are economically beneficial in terms of running costs. The aspirated air, mixed with water viciously by mechanical forces inside the impeller and guide vane, transforms into tiny bubbles. Moreover, the mixed flow of air and water is evenly discharged in multiple directions along the circumference. 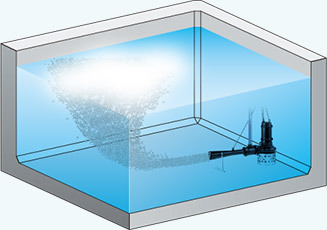 Tiny bubbles are discharged in multiple/one direction, whereby creating convective currents that agitate the water. As the bubbles rise, a large amount of oxygen dissolves in the water. Prevents water incursion due to capillary action should the cable sheath be damaged or the end of cable submerged. Also prevents moist air from infiltrating the motor housing and condensation from forming inside the housing due to temperature differences between the housing and outside air. Miniature Thermal Protector React to excessive heat caused by dry-running. The bimetal strip opens to cause the control panel to shut the power supply. Circle Thermal Protector Directly cuts the motor circuit if excessive heat builds up or overcurrent occurs in the motor. Isolated in the oil chamber where a clean, non-corrosive and abrasion-free lubricating environment is maintained. Compared with the water-cooled outside mechanical seal, it reduces the risk of failure caused by dry-heating and adher-ing matter. The Silicon carbide provides 5 times higher corrosion, wear and heat resistance than the tungsten carbide. Rubber parts are made of NBR or FPM (FKM) which provides higher resistance to heat and chemicals. Used as a "Dust Seal," it protects the mechanical seal from abrasive particles. Protects the mechanical seals by flooding the air passage with an “air seal” that prevents water from contacting the mechanical seals during operation. This proprietary technology helps to prolong the service-life of the mechanical seals. 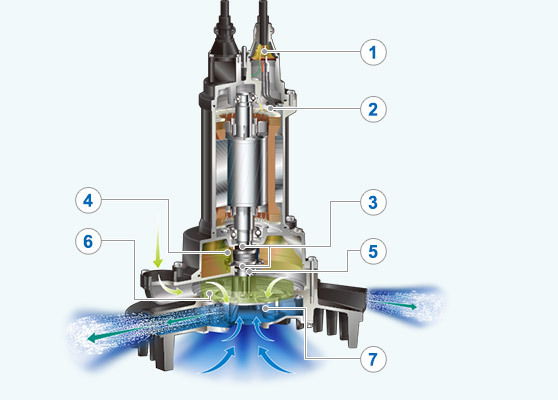 Generates a liquid flow that causes negative pressure to form on the backside of the impeller vanes and draw in air from above the water’s surface. Both the impeller and suction cover are highly wear-resistant 410 stainless steel casting. 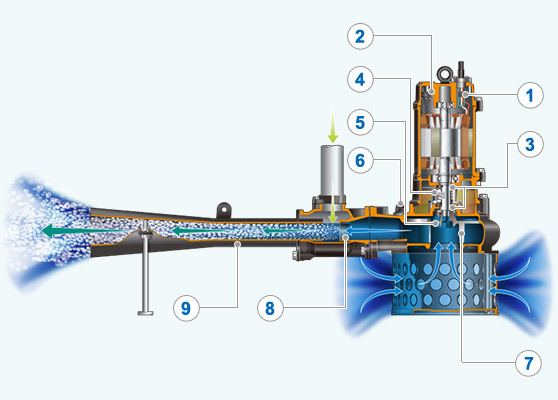 With the jet injector mechanism, the aspirated air mixes with water and is ejected through the diffuser, simultaneously agitating and aerating the ponded water. The mixed air-water is ejected powerfully in one direction, which effectively agitates the water across a wide area. Miniature Thermal Protector Detects excess heat, therefore, protecting the pump against overheating and dry-running. Fitted on the pump casing to prevent the air lock. When air flows through the valve, the ball stays at the bottom, but when the pumped water starts to flow, the ball closes the outlet because of its buoyancy. Minimizes the possibility of trouble due to clogging by foreign matters. Channels the water discharged from the pump into a jet, as part of the jet injector mechanism. Creates a mixed flow of air and water by injecting the aspirated air into the water. 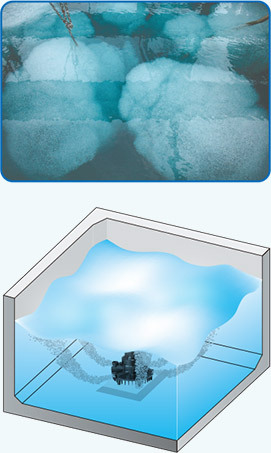 Mixed flow of air-water is discharged in multiple directions. Tiny bubbles produce a high amount of dissolved oxygen. The rising bubbles enable efficient aeration and agitation. Mixed flow of air-water is jetted in one direction. 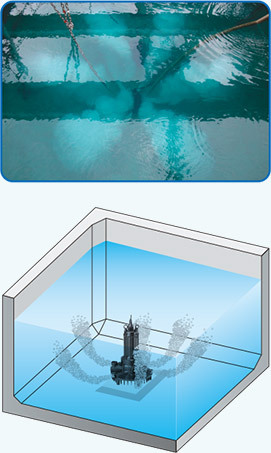 Applicable for deep tank aeration below max. water depth. Because it draws air on its own, the aerator works with a general-purpose blower instead of a high-pressure blower.